Campus Life developer Pocket Gems has announced the official launch of its interactive mobile story platform Episode. The app allows users to read visual stories, making decisions for the main characters along the way, and now features a Writer’s Portal for users to submit their own stories and see them brought to life on the platform. The stories in Episode offer themes found in other Pocket Gems games, like living life on a university campus, finding true love, becoming a top actress and more. While users can read as many stories as they like at once, stories are split into chapters, with one chapter of one story being available at a time. The app is supported via ads, and via the purchase of Passes, which can be used to skip the waiting time between chapters for a single story. During its testing phase, over 10 million chapters were read across the game’s many stories, with an average of 300 chapters read every minute. We had a chance to chat with co-founder and Chief Creative Officer of Pocket Gems, Daniel Terry, about the launch of the Writer’s Portal in Episode, and what users can expect from the platform going forward. Inside Mobile Apps: What inspired Pocket Gems to branch out from gaming for the release of Episode? Daniel Terry: We’re a mobile entertainment company that has roots in games, grew up in games, and remains largely anchored in gaming. Building on that legacy, we saw a huge opportunity to tell stories in a mobile-first way and that’s how the idea for Episode was born. We view Episode as an extension of the core capabilities we’ve developed in building custom worlds and telling stories through games. IMA: Can you offer more details about the Writer’s Portal? Will users be able to submit content and instantly see it added to the app, or will it go through some sort of approval process? DT: The writer’s portal allows authors and aspiring authors to create visual experiences from their ideas and get feedback from a large mobile audience. Episode also gives writers a new medium to distribute their content and the tools to eventually build a following and fanbase. The nature of the platform will also give the audience contact with the creators, making them an active participant in the story’s progression. Currently, we’re working directly with the writers to ensure the best content is on the platform. On launch date we plan to go live and open the portal for everyone. People will be able to create stories and share them on social media. Down the road, we will implement a process that lets people distribute their stories to millions of Episode audience members. IMA: With so many story options, how long does it take to create a story in Episode, from conception to integration within the app? DT: So far the time to create a story has varied based on the writers’ backgrounds and writing styles. Mastering the ins and outs of Episode’s writer’s portal takes under an hour or so on average. Creating a great and engaging story varies drastically depending on the author’s process. 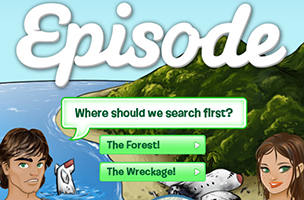 IMA: With the early success of Episode, are there plans to bring similar branched story trees to existing Pocket Gems games, like Campus Life, or future gaming projects? DT: Currently we’re wholly focused on building out great content and a strong community for Episode. Pocket Gems does have a powerful player base with 50% of our current players playing more than one of our games, so it’s possible we could take some of the elements from Episode and utilize them on other projects. There’s nothing on the immediate roadmap though.